Naval pioneer. 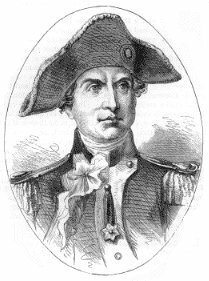 Born at Kirkbean (Dumfries and Galloway), he joined the navy but following charges which resulted from the deaths of men in his command, he settled in Virginia and became an enthusiastic supporter of the American Revolution, most notably establishing the U.S. Navy. Jones led a small Franco-American raiding fleet down the east coast of Scotland in 1779 and was only prevented from attacking Leith when a storm blew up. However, he proceeded southwards and a night battle took place off Flamborough Head, resulting in the capture of one British ship and the sinking of another. Jones' own ship the Bonhomme Richard was also sunk and he retreated to the protection of French-controlled Holland. While not a great naval victory, his voyage certainly succeeded in causing panic in Britain. Later Jones spent time in Russia and France during the French Revolution (1789).